Inter | Sekt is an ever evolving art creative with an "Out Of The Box" approach to art and art marketing. We are comprised of the underdog, independent creators who are often overlooked by art galleries & record companies seeking to represent an aesthetic rather than talent. We are here to shock the system and inspire the imagination. Please visit often for new art, new music and new ideas. If you are an artist or musician seeking representation, feel free to contact us. The art revolution has begun. We are proud to share the work of Rick Andriola. We found Ricks work to be a refreshing fusion of pop art, street art and fine art utilizing color effects reminiscent to some of the screen work of Andy Warhol. He captures familiar faces and scenes that are engrained into the collective unconscious mind of American culture. Join us in our admiration of new art and inspiring creatives again right here at Rogue Gallery. For now, enjoy. 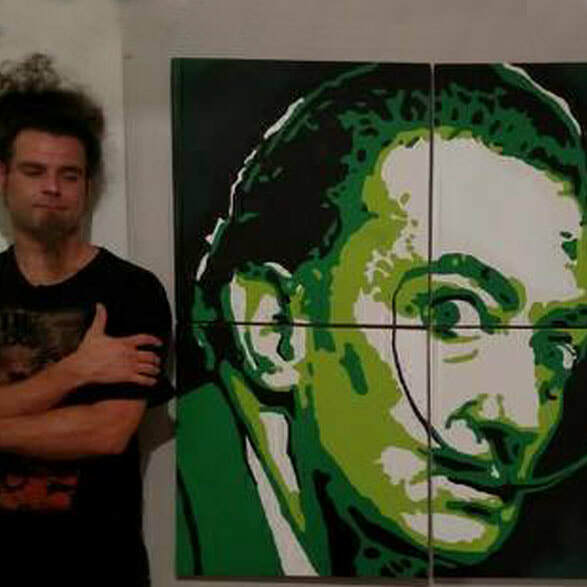 You can see more of his work at his website, www.wickedbigart.com and connect socially at www.facebook.com/wickedbigart. We are extremely excited that he has joined with us here at Inter | Sekt to become part of the New World Creative. ​The concept of Third Friday initially grew from our own desire for a space to show our work which would be void of politics, pandering, or creative restriction. We envisioned a safe space for the creative artist to think, compose, and grow. We welcome you to the incarnation of that dream. Inter|Sekt is part of the New World Creative. Check out these other spots on the web.